Buttery, flaky crust is what makes the pie and these step by step direction on how to make pie crust will give you an amazing crust! 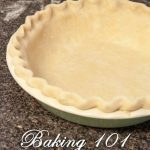 Making your own pie crust might be a scary thought, but once your learn the basics it is very simple. If you don’t own a pastry cutter you can use your hands, (I suggest spending the money on one. It makes life so much easier.) you want to almost snap the butter and the flour in between your fingers. If a recipe calls for blind baking the crust you will want to weigh down the crust with either pie weights or dried beans. 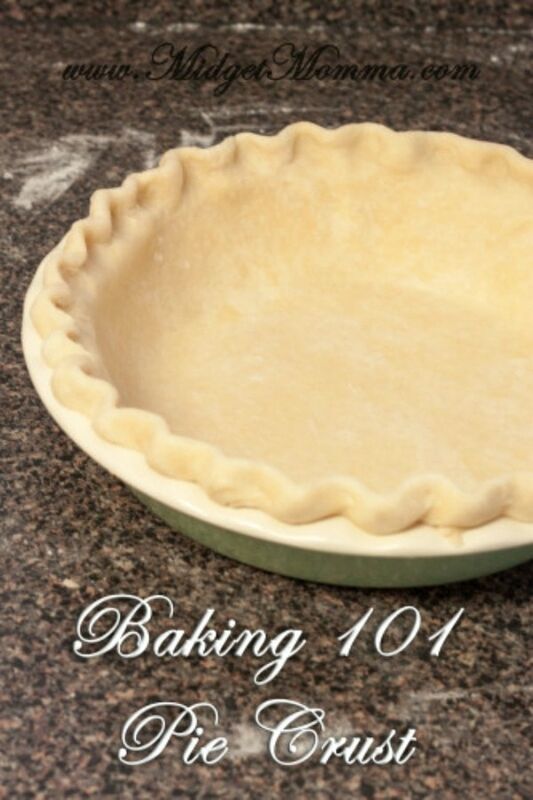 These simple steps for How to Make Pie Crust will make it super easy to make! If you want to make your apple pie fancy you totally can easily too! Just check out how to make Lattice Pie crust Apple pie and how to make the best egg wash for apple pie! With the pastry cutter work the butter and flour mixture together until it looks like small pebbles. Add the water little by little and mix with your hands until the dough comes together. 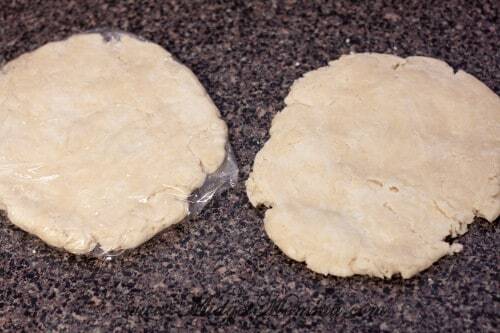 Divide the dough into two equal balls and press flat onto plastic wrap. Chill the dough for at lease an hour. Lightly flour your working surface and roll out your dough, turn it a few inches after a few rolls to achieve a round shape. If it starts to stick add a little extra flour. It should be a little larger than your pie plate. Roll the dough around your rolling pin to easily place the dough into the pan. Using a pairing knife or kitchen shears to trim the dough to a one inch over hang. Fold the dough under and seal to for a edge. 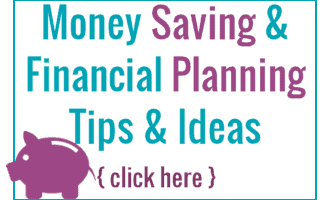 Using your finger tips and knuckles crimp the edges. In a large bowl whisk together the flour, sugar and salt. With the pastry cutter work the butter and flour mixture together until it looks like small pebbles. Add the water little by little and mix with your hands until the dough comes together. Divide the dough into two equal balls and press flat onto plastic wrap. Chill the dough for at lease an hour. Lightly flour your working surface and roll out your dough, turn it a few inches after a few rolls to achieve a round shape. If it starts to stick add a little extra flour. It should be a little larger than your pie plate. Roll the dough around your rolling pin to easily place the dough into the pan. Using a pairing knife or kitchen shears to trim the dough to a one inch over hang. Fold the dough under and seal to for a edge. Using your finger tips and knuckles crimp the edges. It would be two sticks of butter. Using butter is better than shortening in the finished pie crust. What do you preheat oven too?? Is that flour measurement is in by cups or lbs?